Fellow American Academy of Chefs Member ACF Regional Team USA 2012 ACF National Chef Professionalism Award 2010 Who is John Reed CEC®, CCA®, AAC® Certified Cicerone® John Reed is a professional chef with over 30 years’ experience. He is the owner of Customized Culinary Solutions, a culinary consulting firm located in the Chicago Northshore area. He works with restaurant, catering and foodservice companies to provide the highest quality food possible. His contributions include menu and recipe development, emerging concept development, and transition management for companies introducing culinary and production software programs. His company specializes as an on-demand culinary department supporting out-sourced culinary project management. An active member of the ACF, he has earned certifications as a Certified Executive Chef, Certified Culinary Administrator, and American Academy of Chefs. He recently received his Certified Cicerone® accreditation one of only 2100 such certifications globally; John won the ACF National Chef Professionalism Award in 2010. He has competed many times in culinary competitions around the country. As part of the ACF Team USA Regional Culinary Team he competed at the International Culinary Olympics in October 2012. He also volunteered as an operations manager for the ACF US Culinary Olympic Team that represents the US in all major competitions and recognized in international culinary competitions. He was the WCPC Chef of the Year in 2007 and Member of the Year 2010. He was just recently inducted into the Disciples d’ Escoffier International. Presently he serves as Chairmen of the Board for the Chefs and Culinary Professionals of Chicagoland. He is also a member of the Research Chefs Association, Foodservice Consultants Society International and NACE. He also participates in Industry Advisory Boards and Focus Groups. His work experience has taken him around the country from Massachusetts, Florida and Chicago. 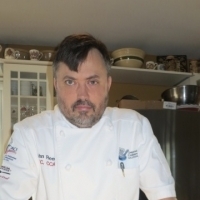 He has worked internationally in Switzerland and England; and worked in premier hotel companies such as The Four Seasons and Swissôtel, multi-unit and privately-owned restaurants and most recently Food For Thought Catering in Chicago where he spent over 9 years as both executive chef of catering and divisional executive chef of the foodservice management division. During that time, he planned and opened several types of food service operations from quick serve food courts, in-house corporate feeding to off-premise catering and country club dining. John also has experience as a culinary educator at Johnson & Wales University in North Miami, Florida and College of DuPage in Glen Ellyn, Illinois. He also holds degree in Culinary Arts from Johnson and Wales University and a bachelor’s degree in Hotel, Restaurant and Travel Administration from the University of Massachusetts, Amherst. John has spent time with the Navy’s Adopt-a-Ship Program supporting the culinary divisions on board both the USS Stethem (DDG-63) and USS Fitzgerald (DDG-62) of the coast of Japan while both ships were in active forward deployment. His work experience has taken him around the country from Massachusetts, Florida and Chicago. He has worked internationally in Switzerland and England; and worked in premier hotel companies such as The Four Seasons and Swissôtel, multi-unit and privately-owned restaurants and most recently Food For Thought Catering in Chicago where he spent over 9 years as both executive chef of catering and divisional executive chef of the foodservice management division. During that time, he planned and opened several types of food service operations from quick serve food courts, in-house corporate feeding to off-premise catering and country club dining. John also has experience as a culinary educator at Johnson & Wales University in North Miami, Florida and College of DuPage in Glen Ellyn, Illinois. He also holds degree in Culinary Arts from Johnson and Wales University and a bachelor’s degree in Hotel, Restaurant and Travel Administration from the University of Massachusetts, Amherst. John has spent time with the Navy’s Adopt-a-Ship Program supporting the culinary divisions on board both the USS Stethem (DDG-63) and USS Fitzgerald (DDG-62) of the coast of Japan while both ships were in active forward deployment.